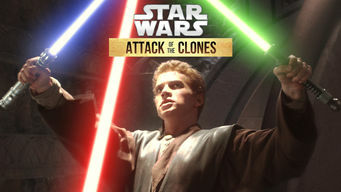 How to watch Star Wars: Episode II: Attack of the Clones (2002) on Netflix Argentina! Yes, Star Wars: Episode II: Attack of the Clones is now available on Argentine Netflix. It arrived for online streaming on October 7, 2017. We'll keep checking Netflix Argentina for Star Wars: Episode II: Attack of the Clones, and this page will be updated with any changes. Growing restless under Obi-Wan Kenobi's leadership, Anakin Skywalker wrestles with demons and desires that begin to pull him in a new direction. Secret armies. A rebellious student. A love that breaks all the rules. The line between light and dark is fading fast.